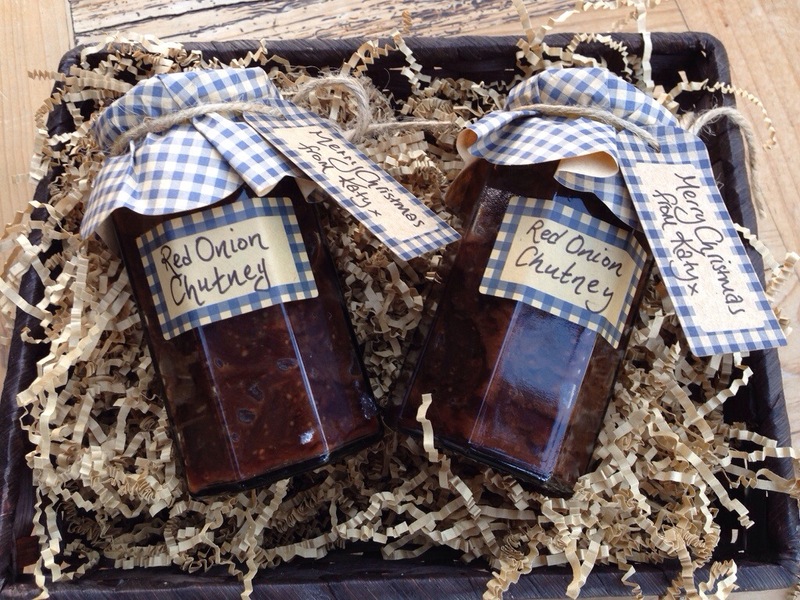 When it comes to accompaniments I love nothing more than caramelised onion chutney. So I figured it was about time I tried making it myself. 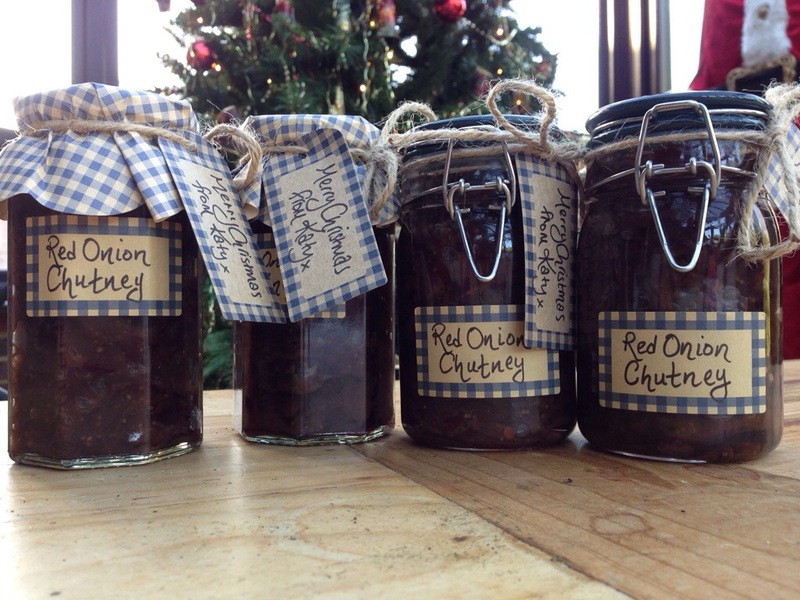 I was also hoping to be able to give jars of my homemade chutney as gifts this Christmas, provided it turned out well of course! I searched for different recipes until I found one I liked the sound of which happened to be on a Jamie Oliver ‘members recipe’ site. I don’t think I have ever stuck completely to a recipe though so I made some changes. This recipe uses white onions but I prefer red (better flavour). It also uses malt vinegar but I swapped more than half the required measure for balsamic, as again I just like the flavour more. Slice the onions finely, I used a food processor. I even used swimming goggles as that amount of onions will make you cry, a lot! Pour the olive oil in the pan and warm, follow with the sliced onions. You must use a low heat as it’s very important that you don’t burn the onions. Slowly cook them and keep turning them to make sure the bottom ones do not burn. Add half the sugar and mix in, let it cook for another few minutes. Follow with the rest of the ingredients and the remaining sugar. Keep the mixture on the a heat for around 15 minutes until the onions and syrupy mixture have gone lovely and thick. Meanwhile, sterilise your clean and washed jars. If you haven’t done this before have a look at this link. It’s very easy. Once the mixture has gone beautifully brown and thick, spoon into your jars. I managed to get 4 decent size jars out of mine. I bought a lovely pack of labels and paper toppers. You can find these in the preserves section of most good department stores like John Lewis. You can always make labels yourself though if you don’t have any. You can even use left over wrapping paper, have fun with your presentation. Voila! It really is that easy. I was so surprised at how simple it was and I will be making this again and again. Next time I think I will dump the malt vinegar entirely and just use 7 fl oz of Balsamic. I may also try it with Muscavado sugar as it’s lovely and rich and I think it will give it an even darker colour and richer flavour. The recipe I used said to leave the chutney for a month, but I assure you it’s ready as soon as it cools down. 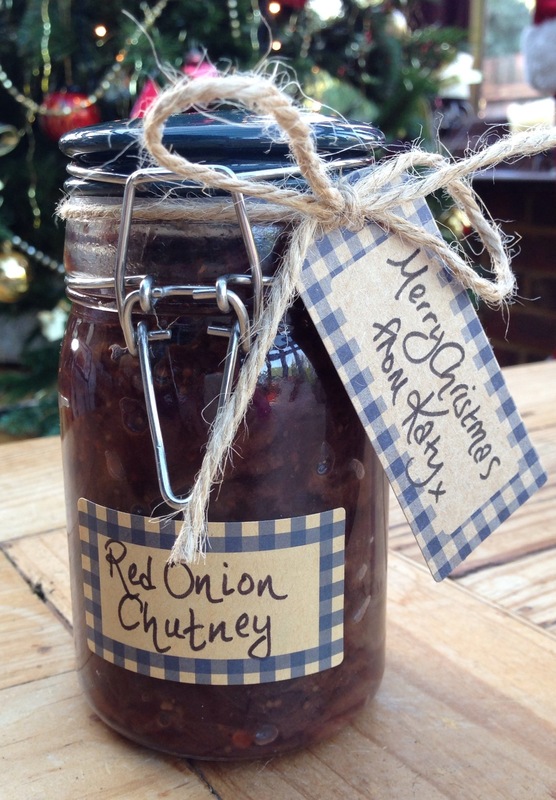 Go on have a go, it makes such a lovely gift and I have to say it’s soooooo good!!! Perfect with cheese this Christmas.